If you see a sick manatee . . . 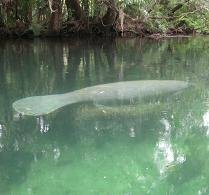 Call the Florida Fish and Wildlife Commission wildlife rescue hotline at 888-404-3922 to alert biologists of sick manatees if you notice the animal's face and lips twitching with tremors and the animal struggling to stay at the surface.